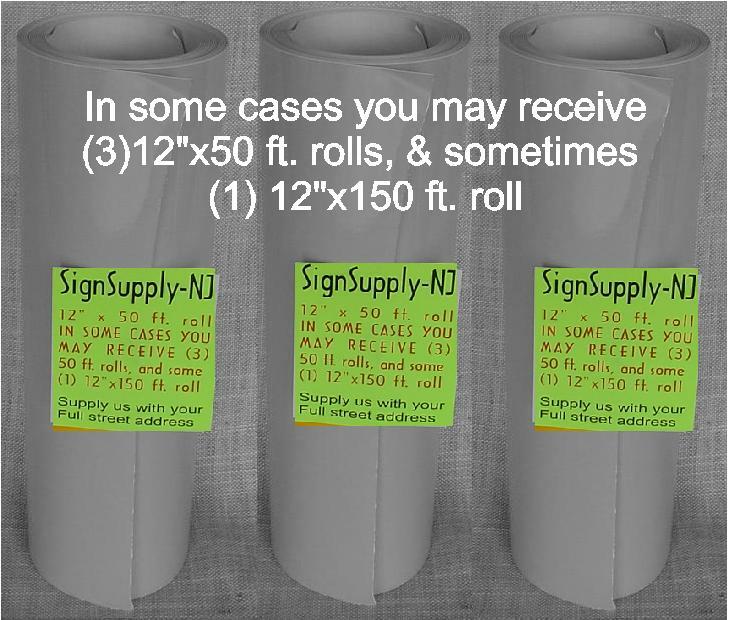 "Very LIMITED AMOUNT, don't DELAY"
If you have a vinyl cutter / plotter or just need some adhesive-backed self stick vinyl to "cut by hand", here is a reasonable, cost effective way to get into production. Priced low enough to be used as a paint mask, or 1 time use sand blasting mask! It's inexpensive enough to use for experimentation. Just cut, peel, and stick. We will be listing more of this vinyl and some different COLORS, RED, BLUE, YELLOW, PLUM, GREEN, BLACK look at our other items. It cuts very well on friction feed vinyl cutters or you can cut quite nicely "free hand" with an "X-acto" knife, razor knife, or scissors. Specifications: Commercial Grade - 3 mil - 5 Yr. 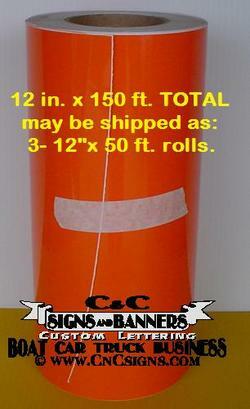 Outdoor Expected Durability, adhesive-backed selfstick vinyl, w/color on both sides. U.S.A. SHIPPING YOU MUST SUPPLY US WITH A FULL STREET ADDRESS. *** NOTE *** LOW, LOW $19.99 S&H, any U.S.A FULL STREET Address. S&H DISCOUNT: If you buy more then (1) - 12"x150' roll (any colors) you PAY ONLY $8.50 S&H for all other rolls shipped at the same time w/in all of the U.S.A., YES: AK, HI, & PR. too. ALL of U.S.A. BUYERS to pay $19.99 S&H w/in all of the U.S.A. SHIPPING & HANDLING out of the U.S.A. See SHIPPING INFO. or eMail us direct. ~ Please allow 5-9 Business days for delivery from CLEARED payment. MOST TIMES MUCH QUICKER!!! ~ Once again, Please NOTE*** you may be receiving (3) THREE 12"x50 ft. rolls of vinyl for a TOTAL of 150 ft (50 yards) of vinyl, Most will receive (1) 50 yd. roll, any questions? Please feel free to eMail us, THANKS. You MUST make only (1) ONE TOTAL PAYMENT, for ALL items. If you don't know how, eMail us and we will help you. We need to receive YOUR NAME & ADDRESS w/in 24 hours. We must receive payment within 4 days of purchase to post "POSITIVE FEEDBACK" for YOU, or else we turn it over for NON PAYMENT! It�s simple! you buy you pay! By buying this item you agree that you have READ ALL of our RULES and agree with all of them before clicking to buy, if not please do not buy this item. All sales are final. NO REFUNDS! SEE ALL of OUR ITEMS FOR MORE GREAT OFFERS!! !